My team was given an impossible challenge: create a user-centered delivery experience out of a business-centered mandate that cared little to none about a user. Not only did we succeed, but we also made our user-centered experience a highly-inclusive and respectful one. We did this through the practice of anti-patterns: a sure-fire method of getting out of a creative rut by exploring the opposite of how or where you would normally look for a solution. During our workshop, we'll show how our scrappy team worked through our design challenge, and immerse the audience in the practice of anti-problems in a creatively-nurturing environment using pre-made scenarios to storyboard with their own interesting and fun solutions. Devin O’Bryan is a designer-educator with an eye for talent and a heart for cultivating that talent. 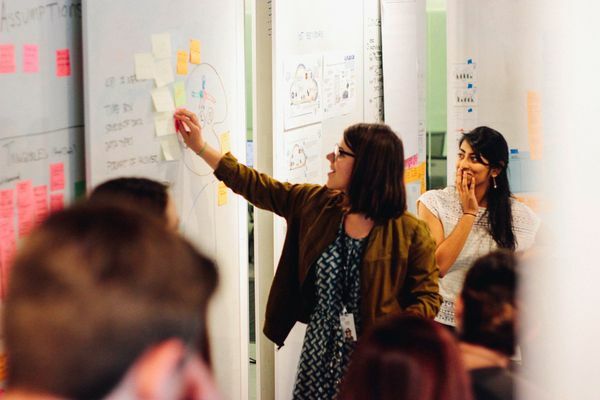 For the last 4 years, he has been co-creating within IBM Corporate HR and IBM Design’s global education efforts with programs like IBM Design Bootcamp Experiences, IBM Design events, as well as building and maintaining the intensive, award-winning Maelstrom internship program from scratch. Most recently, he has had the privilege of serving as creative director if IBM's Project Whitespace. Devin’s personal mental health journey has informed huge swaths of his educational and professional curricula. As such, authenticity is the cornerstone of Devin’s design and life philosophies, and his patient wife and two kids keep him genuine every single day. Andie Young is a Service Designer at IBM’s start-up incubator, Project Whitespace. She is passionate about design solutions, concept development and design research. Loves a busy, creative and enthusiastic environment where people dare to think differently.